CAIK is a part of KFRI which is an institution of KSCSTE. We are located at KSCSTE-KFRI campus, Peechi. Thrissur-680653. Please enter your Analytical Service Registration Number to track the status of the sample submitted. UV/Vis spectrophotometers are usually dual-beam spectrophotometers where the first channel contains the sample and the second channel holds the control for correction. A spectrophotometer has two fundamental parts: a source of radiant light and a monochromator. Monochromator is placed between the light source and the sample which disperses the radiant energy into a spectrum. A slit is also fixed which selects a narrow portion of the spectrum. 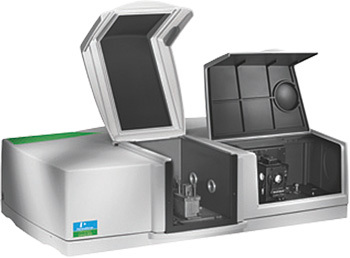 The standard cell or cuvette is placed in a light-tight-unit. The incident light strikes the standard cell and emergent light passes into a photocell. The photocell changes the emerging light energy into measureable electrical energy. Solid: ~50 mg (powder), Thin film: 1.0-1.5 cm, Solution: ~5 ml. Solvent must be specified for solution studies.